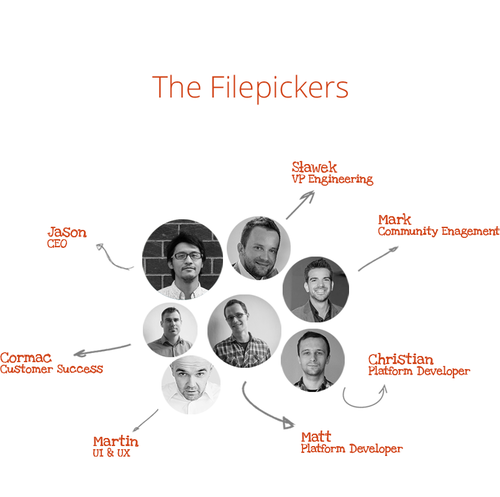 Over the past 2 years Filepicker has matured from a dorm-room idea to help developers like us deal with the pain of uploads, to a YCombinator graduate and a thriving community of over 30,000 live Filepickers that have uploaded over 100 millions files! You’ve seen us build out our partner integrations and ecosystem—removing the technical barriers of connecting files between your app and where data now lives. Our Filepickers are ingesting assets from Dropbox, Instagram, Evernote and a dozen more sources. We’ve support for your favorite platform—from Ruby on Rails to Android to Magento and more. And we’ve built out your most requested pipeline features—from image conversion and cropping to thumbnails and image effects. We’ve done this while maintaining millions and millions of assets moving through our production-deployed Filepickers—giving you blazing-fast file transfer speeds while supporting the growing ecosystem of connected applications. We’ve been at this transition for a few months now and we couldn’t be happier than working with the team, tech and our community. Many of you have already met us on our customer calls and we’ve a laundry list of additions to our roadmap. We’ll have more on that in an upcoming post. We are fully committed to seeing Filepicker continue its growth—and we’d love to chat with you if you have any questions, comments or feedback for us. We’re here at support@filestack.com or 866-873-0249. Give us a ring!